The Love We Make debuts at 9 p.m. Eastern on Showtime. I went into The Love We Make fairly blindly, assuming it was a Paul McCartney concert movie wherein Sir Paul tries to make the country feel better ten years after the Sept. 11 attacks. I expected to love the concert and to love-hate McCartney’s attempts to heal the world. I was pleasantly surprised to discover, though, that The Love We Make is more of a rock documentary than a concert movie, one helmed by documentary veteran Albert Maysles at that. Maysles, along with his brother David, is best known for Grey Gardens and Gimme Shelter, but in this case his prior achievement of note was covering the Beatles when they arrived in New York in 1964. On Sept. 11, 2001, Paul McCartney was on the tarmac at JFK airport when terrorists hit the World Trade Center. 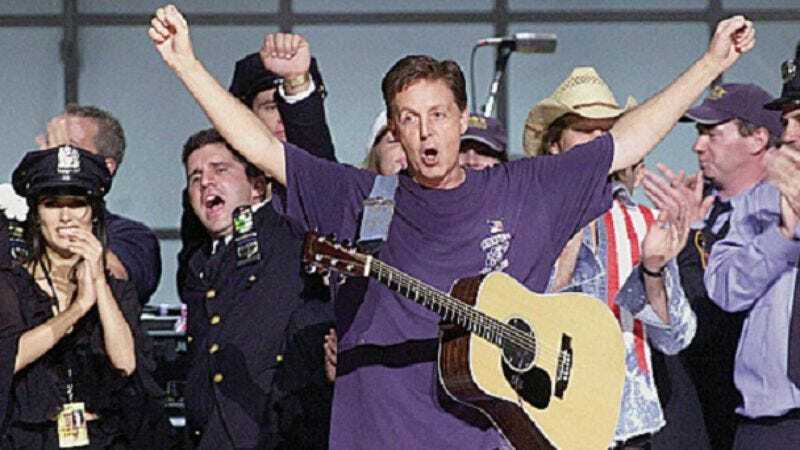 About a month later, McCartney organized The Concert for New York City to raise money for and honor the first responders from the attack. The Love We Make documents McCartney’s time in New York preparing for and performing in the concert. We don’t have many explanations why the film, shot in grainy black and white (except for concert and broadcast interview footage), wasn’t released until now, but it’s not terribly important to know why. The fact that the film takes place entirely within the context of October 2001, with no looking back from present day, helps make it a success as a 9/11 film. Today we might look back and cringe at the thought of Billy Joel singing “New York State Of Mind” to raise people’s spirits or suppress a bit of bile at the McCartney “We Will Rock You” of 9/11 songs, “Freedom,” but at that time it was pretty understandable. The Concert for New York City gave people what they wanted and needed, and as far as benefit concerts go, it’s hard to top in terms of star power and emotion. Whether or not you’re a McCartney fan, some people are simply so famous it’s impossible not to be intrigued by what their lives are like, how different they are from ours. Maysles is an unobtrusive presence, but more importantly, McCartney clearly feels comfortable around him. There’s a brief moment in the documentary where Maysles talks with McCartney about shooting him back in 1964, and there’s a crinkle around McCartney’s eyes that shows that he likes and trusts the documentarian, and isn’t just being nice, as he is to every single other person in the movie, including the pushy people who overstay their welcome in Sir Paul’s presence. In terms of star power, The Love We Make is an embarrassment of riches. Ozzy Osbourne, Sheryl Crow, Eddie Vedder, Eric Clapton, Steve Buscemi, Pete Townshend, Leonardo DiCaprio and a host of others all flit through without announcement (if you were only half-watching the documentary you could easily miss half a dozen celebrities.) It’s fascinating to watch this famous-on-famous interaction. Jim Carrey nods sagely as McCartney opines, “Give me your huddled masses… that’s what it’s all about. If you mess with that, you’ve got a problem.” (Neither are American but both have plenty to love about the country.) Carrey then beams when McCartney says he’s a “big fan.” McCartney protests, “She hosted Saturday Night Live!” when, during the concert, Howard Stern chides Drew Barrymore for fleeing New York. Your TV may overheat and explode from the white heat of charisma when McCartney and Bill Clinton converse. Despite the other stars in the film (even Harrison Ford seems bashful around Macca), Clinton is the only celebrity who doesn’t seem to defer to McCartney at all, and it’s interesting how much the two grasp and hug each other. One thing both men seem to have in common is savoring and retelling what they perceive to be especially poignant or funny quips. There are a few elements of McCartney’s McCartney-ishness that are a little risible, such as his attempts to explain why it’s best not to mess with the United States. Throughout the film he also enthuses about his song “Freedom,” which we all would have been mocking right away had anyone other than McCartney written it. McCartney explains that he wrote “Freedom” to get the crowd stomping and clapping, that he wanted it to be “tingle time.” He talks about it with Eric Clapton shortly before the clunky song is played at the concert so he can fill him on how to play the solo, almost trying to sell it to him. Ten years later, the idea of writing a song simply to get a cathartic emotional rise out of people may seem calculating, but, again, the attacks were barely a month behind the city, so the song and McCartney’s enthusiasm and rationale for it are understandable. The Love We Make isn’t perfect (it could have been perhaps a half-hour shorter), but different aspects of the documentary support each other when certain parts are lacking: The footage of how to put on a concert backs up that of the concert itself and the behind-the-scenes footage of stardom supports that of the more public side. More importantly, the late release of The Love We Make actually feels appropriate, and not manipulative. The “remember whens” of this week can be overbearing, but this documentary actually takes us back, not to the horror of the day but to the hopeful, rebuilding part, and that’s equally as important to remember. The worst thing about this documentary is that “Freedom” may get stuck in your head. I liked the part where McCartney dances in the green room to “Izzo (H.O.V.A. )” before his drummer explains to him who exactly J Hova is. According to Macca, William Shatner’s cover of “Lucy In The Sky With Diamonds” is the “definitive” version.